Finger Cymbals, also known as “zills” in Turkish, are disks of metal worn two on each hand and played by bellydancers. Also known by their Arabic term sajat/sagat, they are not just props, but percussion instruments which add exciting textures of sight and sound to any bellydance performance. 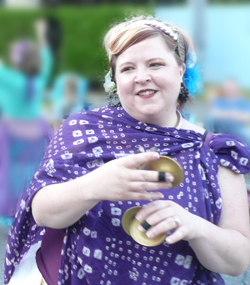 In tribal bellydance, we use a limited number of patterns which compliment our movement vocabulary, but the musical possibilities in a set of finger cymbals are vast and fun to explore. Purchasing: Which finger cymbals are best? This question is definitely subjective, but I own over 15 pairs of cymbals at this point in my career and I speak from experience when I say that for the value and quality, your best bet is Saroyan Mastercrafts. The Afghanis or The Grecian (not the “Small Grecian”) are popular for tribal bellydancers for their warm tone and loud volume. If you do choose to go with another brand of finger cymbals, make sure you purchase good quality ones. If you buy cheaply produced finger cymbals, they will be difficult to play, the sound will not be pleasing to you, and you won’t want to practice! Avoid going to “ethnic groceries” or similar import stores to purchase them–you will be disappointed! Those are prop pieces and are not appropriate instruments for serious playing. Finger cymbals with two wide slots and good quality elastic will stay on your fingers better, which helps you play more confidently. All Saroyan finger cymbals share these traits and are well worth the money spent. You can purchase finger cymbals straight from our store. Measure your elastics and cut to a length, one for your thumb above the knuckle, and one for your middle finger on or above the first knuckle. Your measurement should include about 1″ longer than it needs to go around your finger and through the slots, so you have allowance for securing it on the inside. You can fasten the elastic with a small, sturdy safety pin, or stitch in place with upholstery thread, dental floss, or other strong thread. Make sure your elastics are tight–your fingers should turn a bit blue and at first it won’t feel super comfortable, though it should not be painful. You will be dancing and moving around a lot with these, and if they aren’t tight they will fly off your fingers. Also, the elastic will stretch out with wear, so starting tighter than you think you need insures they maintain a snug fit for longer. I recommend marking which finger cymbals go on which finger. I put a tiny dollop of finger nail polish on each of my thumb cymbals. Another option is to stitch a small bead on the excess elastic inside the bell of the cymbal. Having a mark which is tactile–that you can feel and not just see–will serve you if you are ever in a dark back stage area and can’t easily see which finger cymbals are which. Once your finger cymbals are ready to go, make sure you have some little pouch or bag to store them in. Finger cymbals are notorious for going on solo walkabout, and three finger cymbals are no good to you. Just a simple little drawstring bag or similar device will keep your finger cymbals together, makes them easy to toss into your dance bag to head to class, and be able to grab them out again without having to fish around in your dance bag later to scrounge them back together. Finding a little time to practice at home each week will go a long way to help increase your strength, speed, and confidence with playing. If you have pets, family members, or close-in neighbors who you think might be bothered by your playing, there are a couple ways to muffle your cymbals. One popular method is baby socks. Simply purchase a single pair (a thrift store is a great place to grab some), and put one sock on one finger cymbal on each hand. If you are of the crafty persuasion, you might choose to crochet yourself some zill mufflers, two patterns are offered on Shira’s site, here. Both of these methods will muffle your playing very effectively, however the downside is that it changes the way the finger cymbals feel–the cushiness of the socks makes for a “muddy” playing experience. An alternative is to take a few pieces of any tape which doesn’t leave residue behind, such as painters tape or masking tape, and criss-crossing them across the open bell of the cymbals. This is the method I used in my apartment back in my baby-dancer days and it worked great and had less effect on the feel of playing. Just make sure to remove the tape when you are done playing, so you don’t leave any unwanted stickiness behind. If you don’t wish to muffle your finger cymbals, so you can work on different tones and sounds, or because you want an unfettered finger cymbal experience, I heartily recommend taking a walk with your finger cymbals. Walk around your block, or head to a local park and jam. This has the added bonus of getting you moving while you play, which is important to practice since you won’t be sitting on a couch when you play these babies in class!